Game can be modded by editing some files and includes a 'modding kit' for use with Unity (available for free). Game suffers from numerous bugs which hamper play. Most game breaking bugs have been fixed via patches. Poorly optimized; constant frame drops and stuttering in outdoor areas and towns. Developers have abandoned the game and no further patches will be released. The Digital Deluxe edition includes The Falcon & The Unicorn DLC, The Dream Shard DLC and Might and Magic VI: The Mandate of Heaven along with other non-game bonuses. For Windows: 401 - Uplay version, 403 - Steam version. Mostly Hor+, some scenes Vert-. Centers itself between all attached monitors. Various FXAA modes, NFAA, DLAA, SSAA. All are post process. Ignores frame rate cap option. Includes cap option which ranges from off to 500. Sound effects, Music, Voice. Toggle on/off for ambiance/monsters. By design, can't be changed. Game pauses all engine activity in the background, including loading. 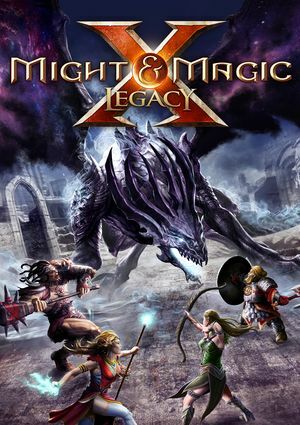 See Helix Mod: Might & Magic X - Legacy. ↑ 2.0 2.1 File/folder structure within this directory reflects the path(s) listed for Windows and/or Steam game data (use Wine regedit to access Windows registry paths). Games with Steam Cloud support may store data in ~/.steam/steam/userdata/<user-id>/238750/ in addition to or instead of this directory. The app ID (238750) may differ in some cases. Treat backslashes as forward slashes. See the glossary page for details.